Move your leaf springs 3.5" inboard for maximum tire clearance. 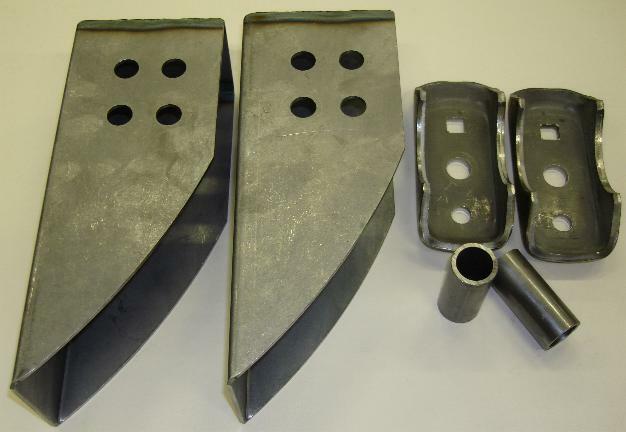 Use this kit to mount your leaf springs underneath your frame rails to maximize tire clearance in your A-body. Set includes our own one-piece front boxes, made of heavier 11 Gauge steel. They offer 4 possible mounting holes - stock, 1.25" lower, 1.5" back, and 1.5" back with 1.25" lower. All holes are standard 5/8". Also includes a set of heavy guage axle seats for use on 3" axle tubes, and 120-wall shackle tube to weld through frame rail for shackles. Tube uses 7/8"(a-body) bushings. SOLD AS A COMPLETE SET, USE ONE SET PER CAR.